Interactive Calendar has a spell-checking feature. You can check spelling not only in the main text editor. This function will work and for any text box in the program if "Tools - Automatic spell-checking" option is turned on. To run spell-checking manually click the "Spell Checking" button in the text editor or press F7 button on your keyboard. 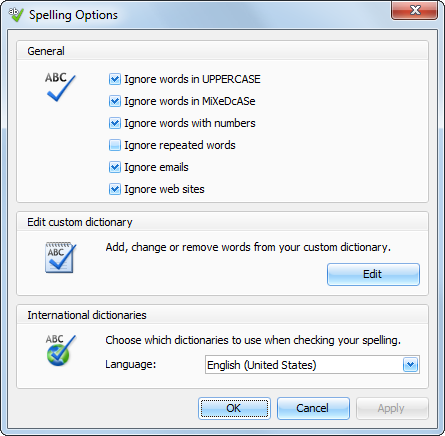 Here you can change various spelling options, edit custom dictionary and manage added dictionaries. Interactive Calendar supports Hunspell dictionaries. You can download them at our website. 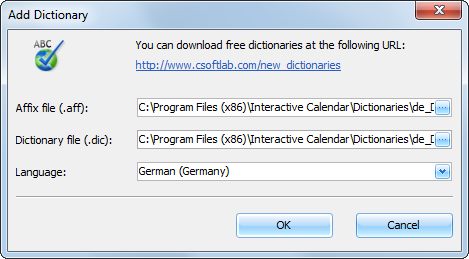 When you download the dictionary package, please unpack it into "...\Interactive Calendar\Dictionaries\" folder, add a path to .aff and .dic files into the "Add Dictionary" window and select language. When you click OK, the dictionary will be added and turned on. If you not found a dictionary for your language at our website, please note that Hunspell is the spell checker of LibreOffice, OpenOffice.org, Mozilla Firefox 3 & Thunderbird, Google Chrome, and it is also used by proprietary software packages, like Mac OS X, InDesign, memoQ, Opera and SDL Trados. Try to find the necessary files in Internet.